This entry was posted on 15th June 2018 by Chris Harle. It wasn’t a good start to the trip. I was standing in the middle of a service station car park locked out of my car. The keys were in the ignition, the radio was on, my phone and wallet were on the passenger seat. But worst of all my coffee that I’d just bought was going cold. I recruited the help of two good humoured traffic police. However they had no ‘trick’ suggestions, just a hammer to break the smallest side window! I was soon back on the road to meet Martin at his mum’s in Barnoldswick. I’ve known Martin for 37 years; we both worked at an outdoor centre in South Wales and in those early years we did a lot of climbing and caving together. 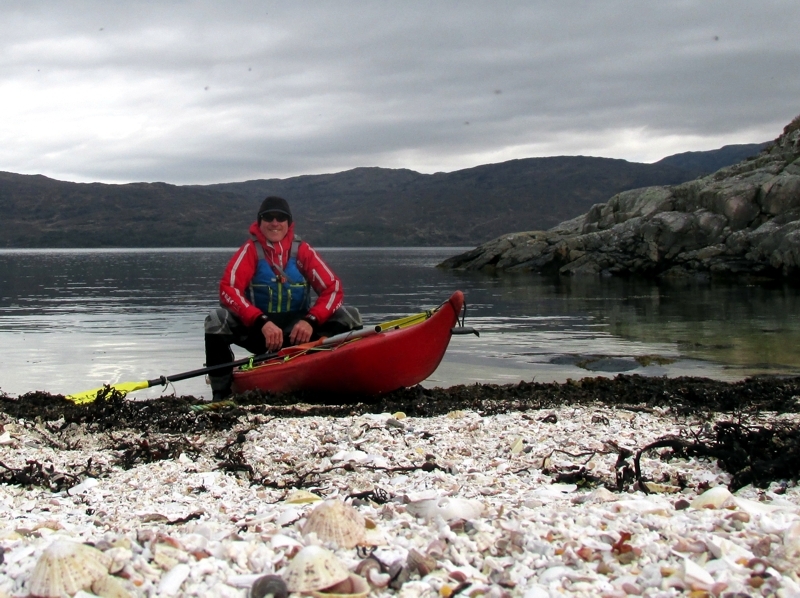 Nowadays sea kayaking tends to be our activity of choice even though I couldn’t live much further from the sea. In recent years we have made an annual pilgrimage to the north west coast of Scotland. Searching for wild places along its coastal margins. With the vagaries of the weather plan A became plan B, so we headed for Mallaig intending to journey north towards the Kyle of Lochalsh and beyond. This itinerary promised much new territory, continuous mountain scenery, open water crossings. As well as plenty of wildlife, multiple possibilities for wild camping, and a variety of coastal features (skerries, islands, cliffs and sandy beaches). Although we didn’t arrive at Mallaig until 7pm we decided to pack the kayaks and launch immediately. Soon after we left the harbour the sun set gloriously over the Cuillin of Skye. It wasn’t long before we found a suitable pebble beach to land on with just enough flat(ish) ground to pitch our two small tents. 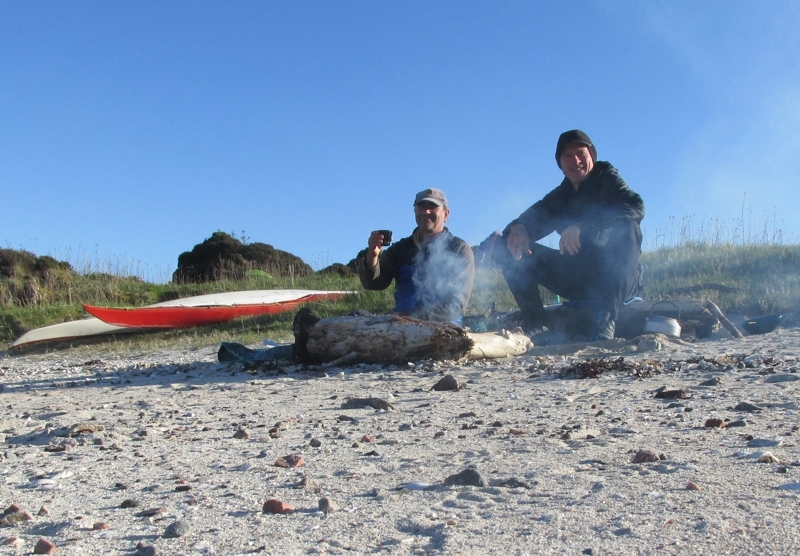 I woke early next morning and soon established a fire on the beach from scattered driftwood. Beach fires have become a tradition on our trips and this year was no different. We’ve always found just enough wood to pass the time in idyllic settings whilst savouring a whisky (or two). Wind and tide generally assisted our 2-day journey between the Knoydart peninsular and the Isle of Skye. 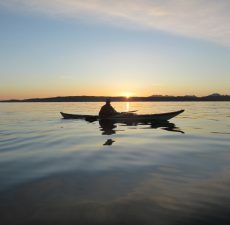 We paddled through the straits of Kyle Rhea, and eventually to the Kyle of Lochalsh. Here we replenished our stock of food and drink before paddling under the iconic Skye Bridge and heading towards Plockton. The campsite that we eventually found was stunning. A small hidden bay with a sandy beach and perfectly flat grassy terrace covered with primroses. Our return journey south was marginally delayed by strong headwinds. The hard work with little to no progress was compensated by the curiosity of hundreds of common seals that watched and splashed close by. 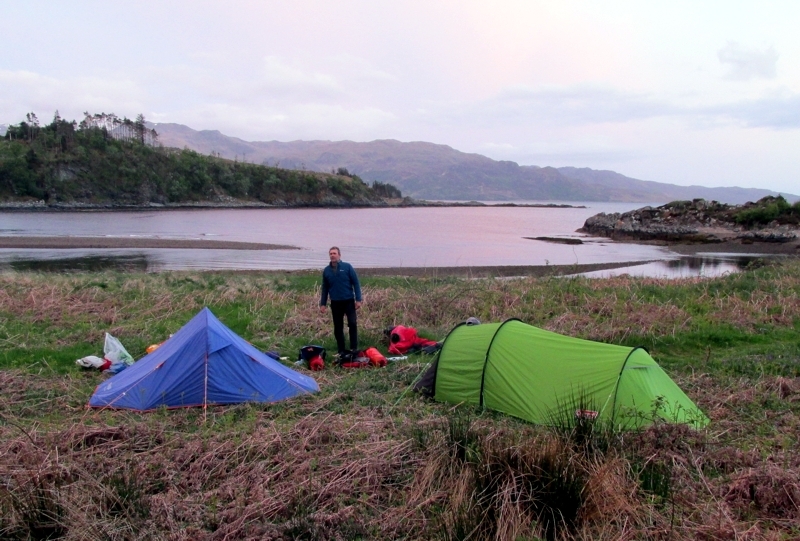 Another highlight was camping at the beautiful and atmospheric Sandaig Bay. Immortalised as Camusfearna in ‘Ring of Bright Water’ by Gavin Maxwell where he lived with his pet otters. By now the wind had died to create a tranquil oily sea that was perfect for paddling at a leisurely pace and watching the wildlife. We were delighted to have our own brief encounter with an otter in calm, crystal-clear water and later two golden eagles soared effortlessly overhead. I was less delighted to remove three ticks off my leg! This 60-mile round trip with five nights of camping had all the ingredients of a really enjoyable holiday in the great outdoors. Self-sufficiency, just enough challenge, unbeatable scenery (usually with the backdrop of the magnificent Skye Ridge), remote beachside campsites, an abundance of provisions, no midges, only a few hours of rain… it just doesn’t get much better.